Established in Japan, the Toyota corporation earned its name from Kiirchiro Toyoda who created the company. Toyota builds automobiles that offer a combination of style, refinement, durability and reliability. In the mid 30s the company was formally named the Toyota Motor Corporation. Under the new brand name it developed its first automobile, the A1. Over the next decade Toyota also created a pickup and another car, forming a total production of more than 100,000 vehicles. The lineup was further developed in the 1950s with the introduction of some smaller cars and the BJ truck. At the end of the decade Toyota began exporting to the U.S. The Toyota Crown was the first export to get to the American market. The 60s brought about more growth. The ever popular Corolla was launched along with the Hiace, the Publica, the Miniace, and the 2000GT. Over one million vehicles had been built by Toyota by the end of the 60s. In the 1970s the Carina, the Publica Starlet, the Celica, the Corona, the MkII, and the Light Ace were launched. The Corolla also maintained its sales success. Toyota responded to the oil crisis with the creation of smaller and more fuel efficient vehicles. At the end of the 70s Toyota had sent more than ten million vehicles to the United States. The 4Runner, the Camry and the MR2 came out in the 80s. The Camry proved to be the most successful on the market. The RAV4 and the Avalon were launched in the next decade, helping Toyota reach its hundred million mark in production. In the 90s Toyota was also creating innovative technological features for its automobiles. The first hybrid mass produced by the brand was the Prius. The current Toyota lineup includes the Avalon, the Camry, the Corolla, the Highlander and the 4Runner. The Avalon has two trim options that bring leather upholstery, speed control, leather upholstery, a sunroof, twin region air management, a rear visibility camera, alloy wheels, Bluetooth, USB and iPod interface, satellite radio, and a nine speaker audio system. The Camry comes with four trim choices and power components, steel wheels, a CD player, speed control, Bluetooth, and a six speaker audio system. The Corolla offers three trims and a trip computer, remote entry, air conditioning, steel wheels, four audio speakers and a CD player. The Highlander features three trims with fabric upholstery, alloy wheels, a CD player, air conditioning, and six speakers. 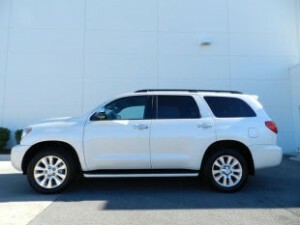 The 4Runner has three trims and speed control, heated mirrors, hill descent and assist equipment, a trip computer, satellite radio, Bluetooth and iPod interface and an eight speaker audio system. Come in to Carson Cars for the best selection of Toyota for sale in Lynnwood, Wa.